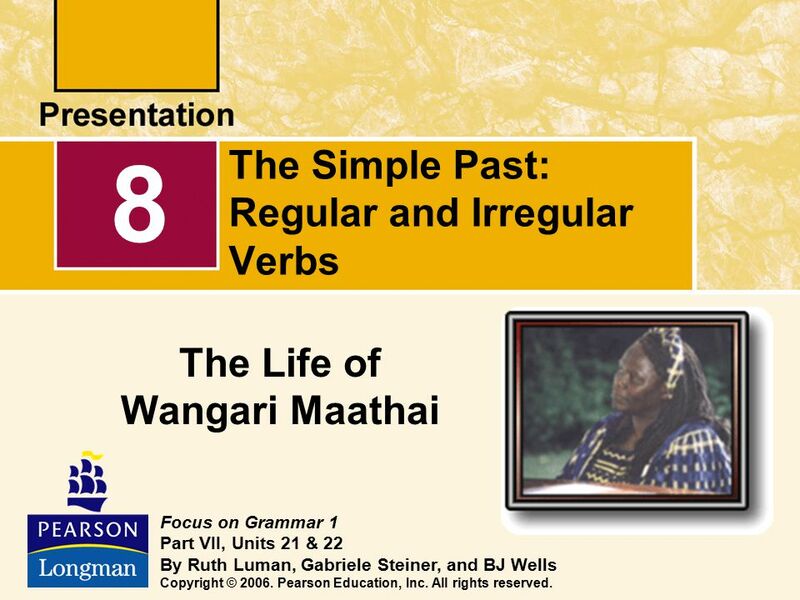 8 The Simple Past: Regular and Irregular Verbs The Life of Wangari Maathai Focus on Grammar 1 Part VII, Units 21 & 22 By Ruth Luman, Gabriele Steiner, and BJ Wells Copyright © Pearson Education, Inc. All rights reserved. 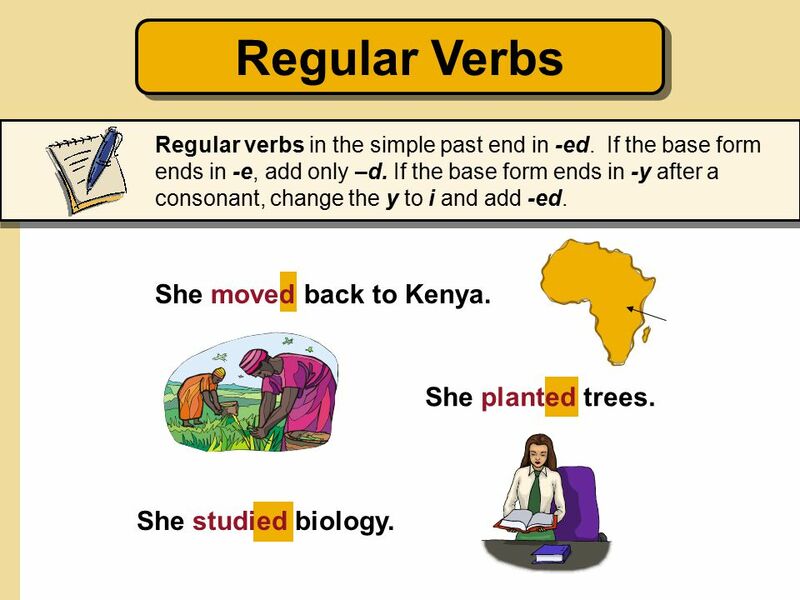 4 Regular Verbs She moved back to Kenya. She planted trees. 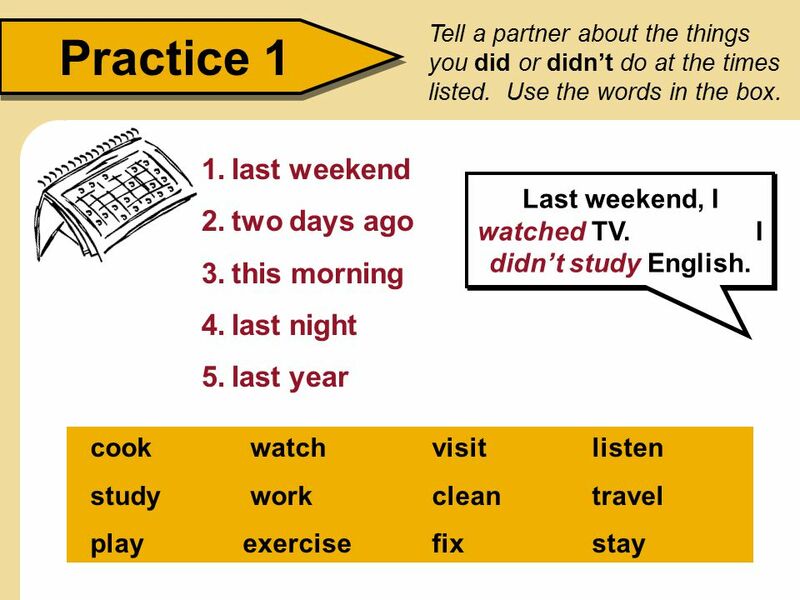 Regular verbs in the simple past end in -ed. If the base form ends in -e, add only –d. If the base form ends in -y after a consonant, change the y to i and add -ed. She moved back to Kenya. She planted trees. 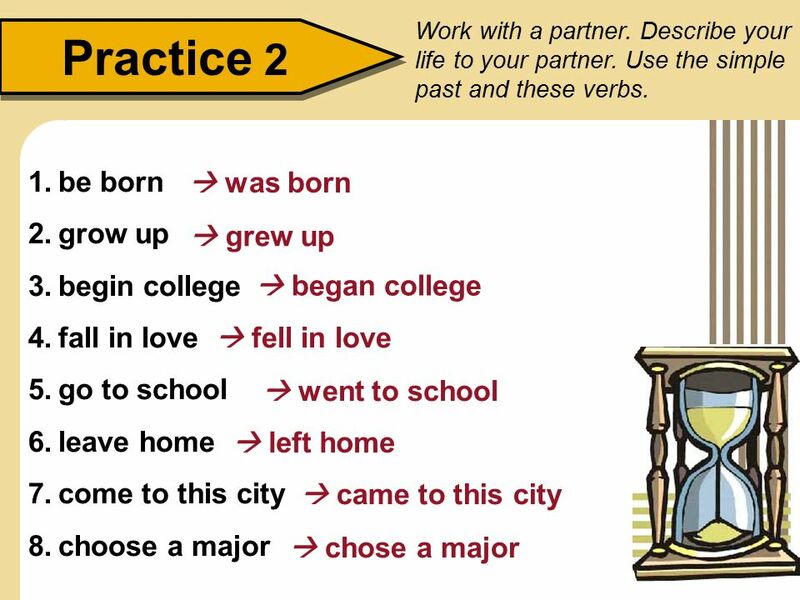 UBEAUJO	2/13/2006 Change to: Regular (bold) verbs (bold) in the simple past end in -ed (bold, italics). If the base form ends -e (bold, italics), add only -d (bold italics). If the base form ends in -y (bold, italics) after a consonant, change the y (bold italics) to i (bold, italics) and add -ed (bold, italics). She studied biology. 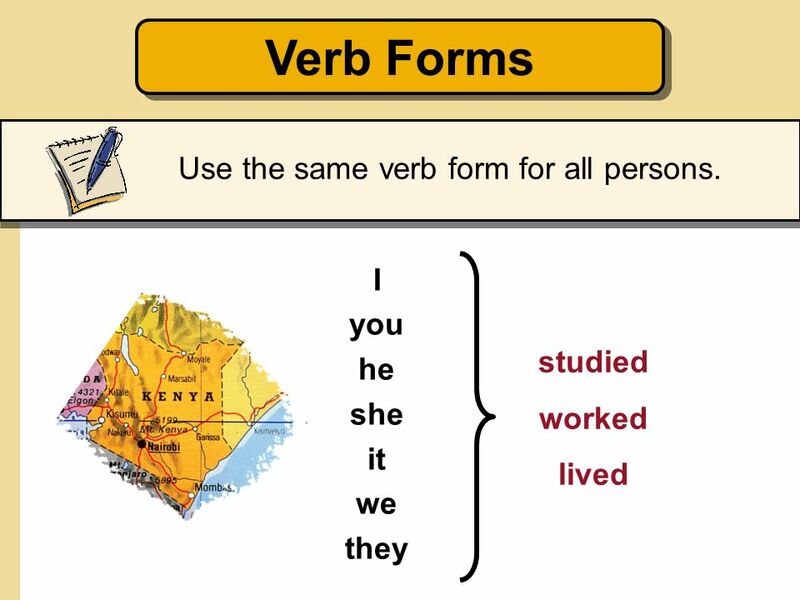 5 Use the same verb form for all persons. 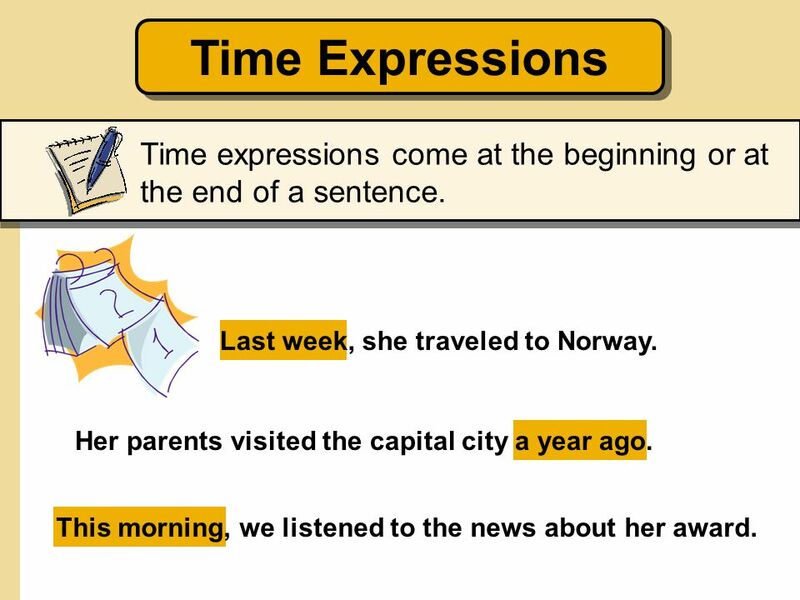 7 Time Expressions Time expressions come at the beginning or at the end of a sentence. Last week, she traveled to Norway. Her parents visited the capital city a year ago. This morning, we listened to the news about her award. 8 Last weekend, I watched TV. I didn’t study English. 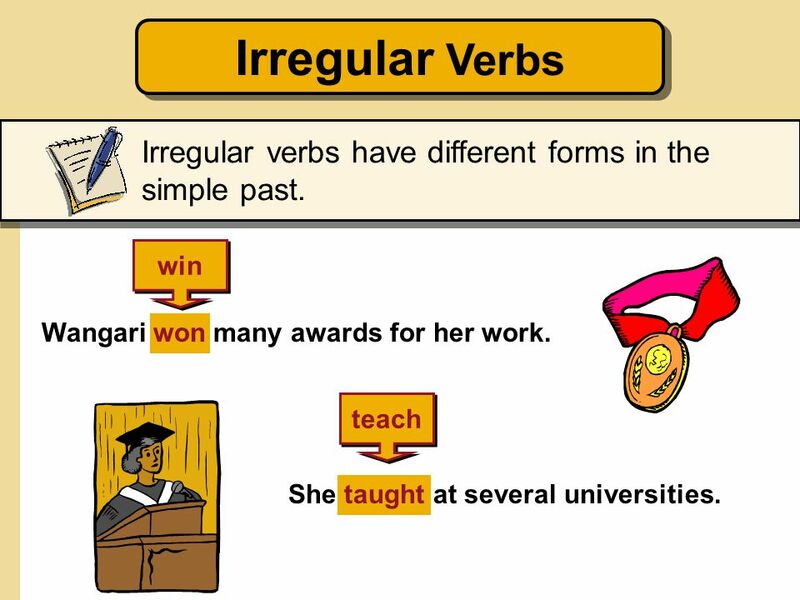 9 Irregular Verbs Irregular verbs have different forms in the simple past. win Wangari won many awards for her work. teach She taught at several universities. 10 Negative 2 Be careful! 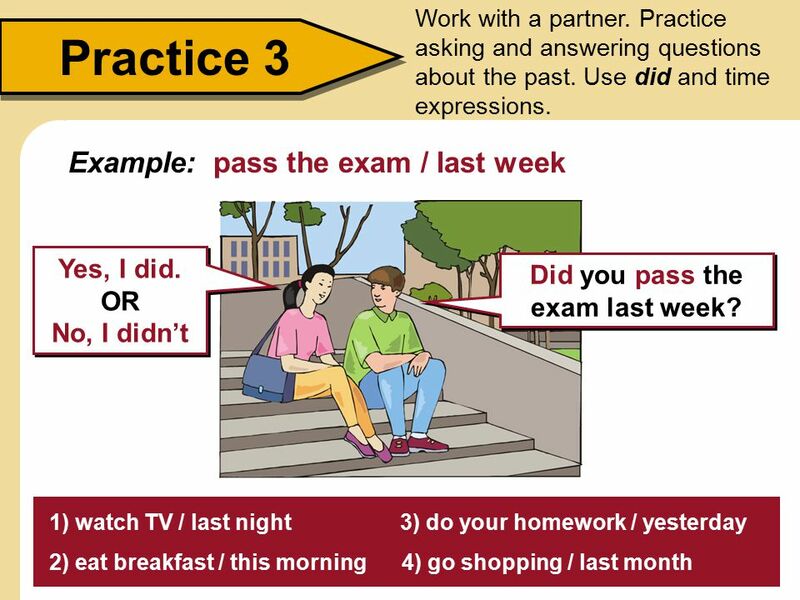 Don’t use did or didn’t with the past tense form of the verb. 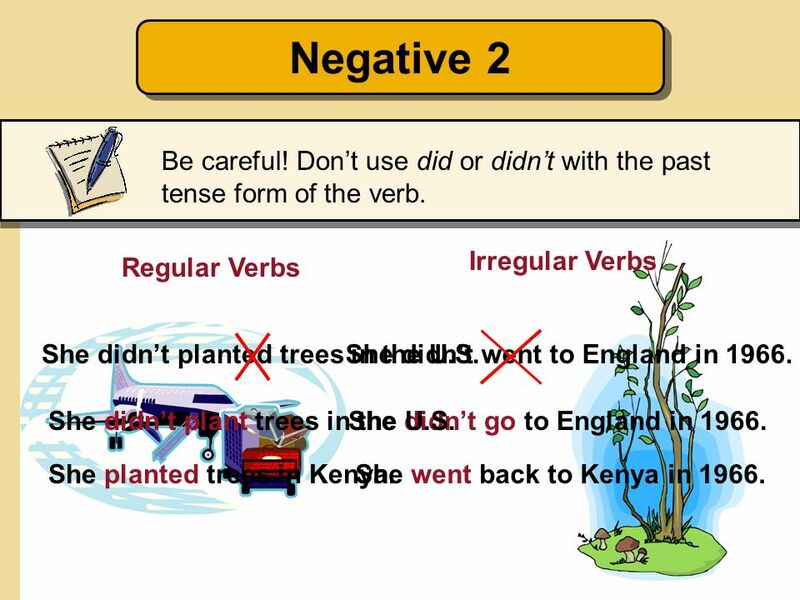 Irregular Verbs Regular Verbs She didn’t planted trees in the U.S. She didn’t went to England in 1966. UBEAUJO	2/6/2006 ADD A SLIDE: Header: Negative Grammar rule bar: Be careful! Don't sue did (italics) or didn't (italics) with the past tense for of the verb. Body: Regular Verbs: She didn't plant trees in the U.S. [animate and highlight (planted) and (didn't plant)] [art: picture of an African woman plantin trees. (United States) appears, is crossed out with an "X", and (Kenya) appears appears. 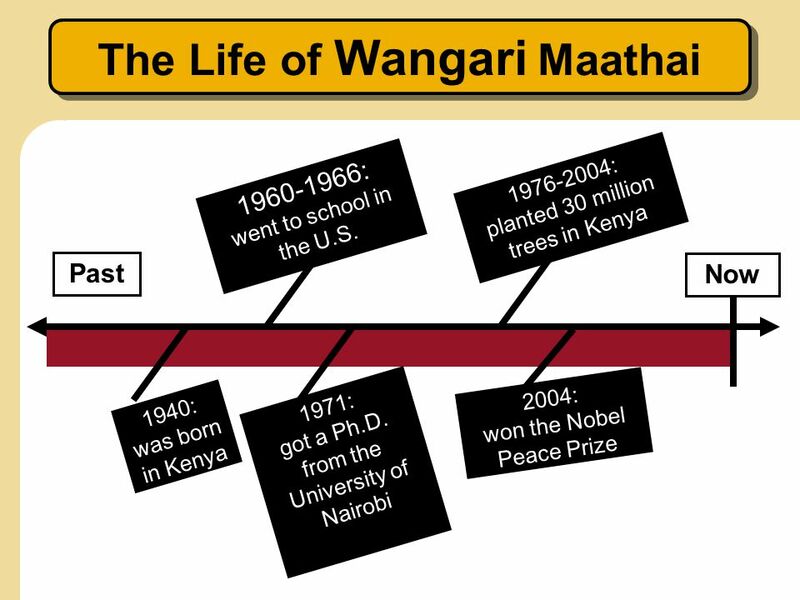 She planted trees in Kenya Irregular: She didn't go to England in 1966. [animate and higllight (went) and (didn't go)] [art: African woman heading to the airport gate (luggage), the wrong date appears above, is crossed out with an "X", and is followed by the correct date appearing] She went back to Kenya in 1966. She didn’t plant trees in the U.S. She didn’t go to England in 1966. She planted trees in Kenya. She went back to Kenya in 1966. 12 Yes / No Questions Did she finish college? her parents Did help her? 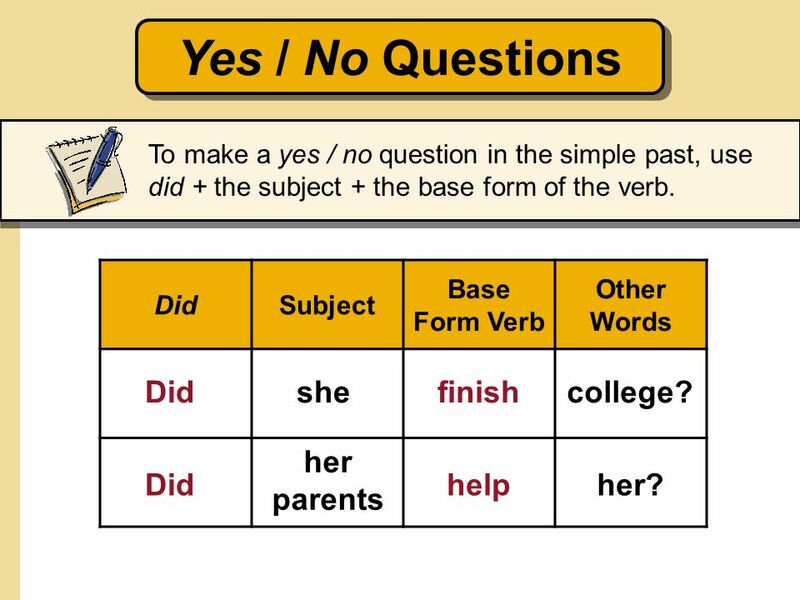 To make a yes / no question in the simple past, use did + the subject + the base form of the verb. Did Subject Base Form Verb Other Words Did she finish college? her parents Did help her? 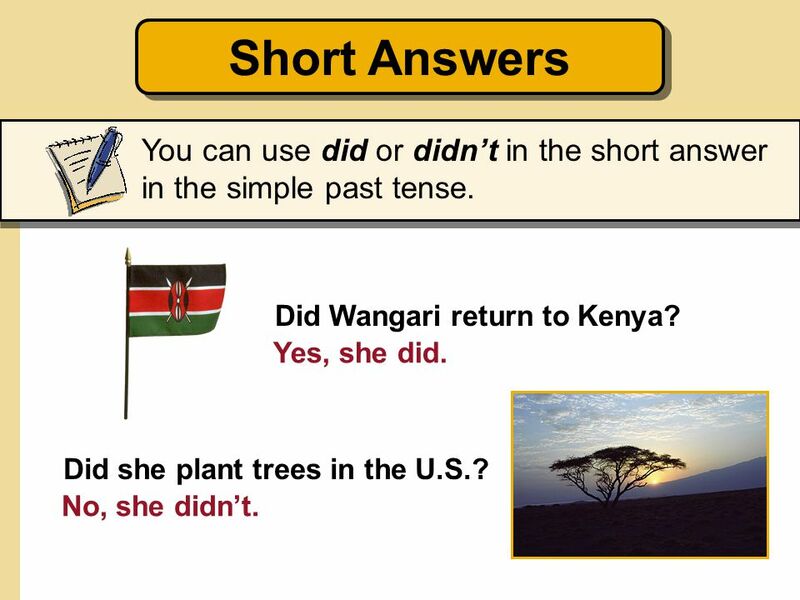 13 Short Answers You can use did or didn’t in the short answer in the simple past tense. Did Wangari return to Kenya? Yes, she did. Did she plant trees in the U.S.? No, she didn’t. 14 Did you pass the exam last week? 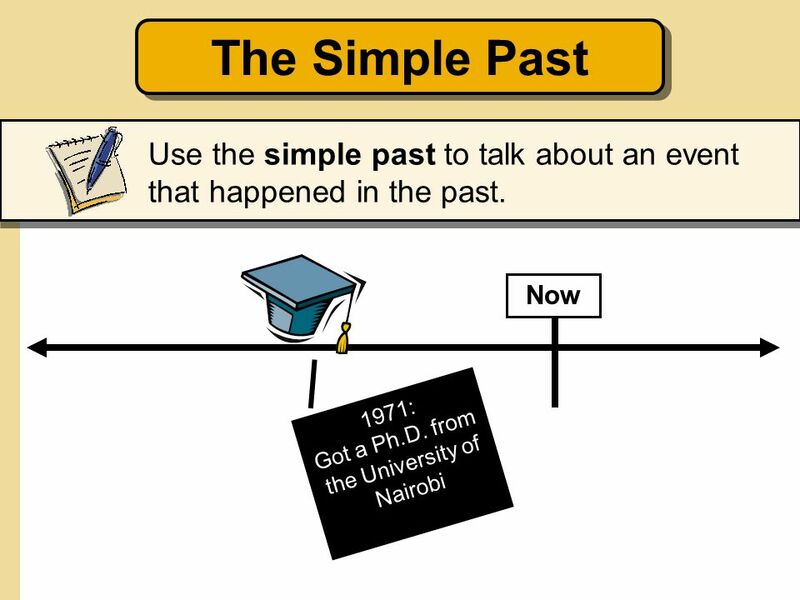 Download ppt "The Simple Past: Regular and Irregular Verbs"
INSTRUCTIONS  Slides 2 to 8 contain explanations on the use of the simple past. 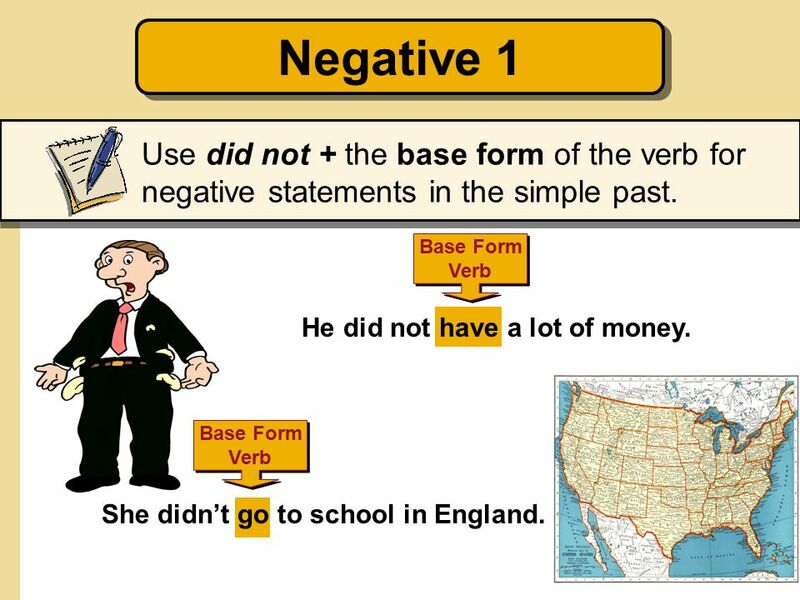  On slide 6, elicit from students the past form of the verbs displayed. Yesterday I went for a swim.